I work on the phenomenon of “inner song.” Usually I interview classical musicians, but I like electronic music as well, and I do think electronic musicians have a very particular approach to sound that is worthy to include in my research. May I ask you to start by describing your relationship with sound? I’ve been creating music using computers for a fairly long time. I started when I was about 12 years old. Because of this, I developed a very visual sense of sound. Just from looking at a computer screen and arranging notes on the screen and watching data change throughout time. So I did develop this very visual intuition in thinking about sound and how we organize it, how we change it through a graphical interface. And then, later on when I began to study sound a little more formally, I was intrigued by the fact that we can visualize sound, we can look at the frequency spectrum of sounds and can see energy and all those different frequency areas. In this way we can sort of convert sounds into images and develop intuition about it. I’ve also professionally worked as a sound designer for films, which is a process that again involves a tremendous amount of time looking at visual representations of sounds on a computer screen, and then making small manipulations to those visualizations. So, just because of all those experiences, I think I have a sort of inherent visual feeling about sound. And, it is actually something I try to get away from. Because I’ve spent so much time working on a computer screen, it can become an obstacle if that is the only way I think about sound—in terms of some graphical representation of it. So how have you worked on that? When I was in graduate school, I worked with a composer called Pauline Oliveros. I was very lucky that she was there. I was taking a deep listening course, which is a semester of studying listening practices, meditation practices that are focused on sound. There is no computer or technology whatsoever. It is just a practice of sitting and listening and responding to sound, as it is inherently a physical force interacting with our bodies and minds. That was a very powerful experience for me, developing listening practice more rooted in the body and mind. And I think that experience opened up my mind in a lot of ways, especially about real world sound environments. When you speak about visual representation, is it the spectrum on the computer or other images? I watched some of your videos on YouTube, and you work with visual artists—are you also speaking about those kinds of visual representations? There is a kind of variety. Some of it is rooted in the tradition of just notation, organizing notes over time. But some of it is more scientific, where if you ask me, “what does the sound of a saxophone look like?” I would probably draw you a wave form the same thing you would see on the oscilloscope. If you ask somebody else that question, maybe they would draw you a sunrise or something more about the feeling of that sound. But because I have this experience rooted in digital audio, I would first think about a wave form. That’s another way that I visualize sound: not only as notes which have pitch and duration, but I think about the actual waveform. And then another way that I would visualize it is in terms of a spectrogram, which is a way of looking at the sound in the frequency domain. And when we think of the sound in that way, we can look at the note of a guitar and see the fundamental frequency of the note, and then all the harmonics stacked up and they would all be separate lines in the spectrogram. These are a few ways that I would visualize a sound. And then I am pretty interested in audio-visual artwork, where we can have one idea that is expressed through multiple modalities. So, if I wanted to express a musical idea in a visual way, I would take one of those three representations as a sort of structure, and then try to express it in a way that is more beautiful or compelling. Something that would add some layers to it, beyond just a scientific representation. So, in this case, does the image come first and then the music or the reverse? Actually, I am interested in making work where neither comes first. So for example, I make artwork that is in galleries, and I make pieces that are video projections with sound that accompanies each particular image. When I am creating a piece like that, I need to think about what it looks like, what the images are, and if the sequences of images create the feeling that I want, as well as the sound. There is a sort of one algorithm that is simultaneously expressing something visually and expressing it with sound, and so the decisions that are made are simultaneously visual and musical. And that encourages a very different way of thinking, because it is not simply visual or simply musical, it is both, and that is a very different way of art-making. I think with an approach like that you get a very different result than somebody whose process is purely musical or purely visual. Why? Is it because it expresses your feeling in multiple ways? I try to find a way of organizing structures that is simultaneously visual and musical, and there are things that coexist in this world like films have rhythm, the pace of editing creates a visual rhythm, films have texture with a density of images, they have colors and sounds that are overlapping metaphors. And when we force the structures to line up, then we develop a spirit that is in between listening and looking. I guess the simplest way I can speak about it is that it feels very different creating work in that way than creating works that are purely musical. For you. And for the audience? I do think that something that is made in that way will be received very differently. And that could be purely because it does have a different process. Is it a kind of synesthesia? That’s another excellent demonstration of that same idea. In that work, I created a musical score that was reacting to his movement in space as a dancer. He was dancing and you were trying to create a musical sound. Yes. That was basically a mapping system: his body was articulating sounds. The thinking about it is simultaneously visual and musical because we are watching Silas dancing, and I want this musical relationship to be meaningful visually so that when we are watching his motions, the sounds that are created seem to have a relationship to what we are seeing. And then, of course, we are thinking about it musically, as well, because it is sculpting this sounds that we hear. There is a spacial dimension: the space. Yes. And the body in space. So this is not connected to classical music-learning, is it? When I was a child, I studied piano. I studied classical music theory, but it doesn’t deeply inform my work. I think I was a very bad piano student. When I would learn a piano piece by Beethoven, I wasn’t excited by that process. I felt that the best I could do was a performance that we would have heard a thousand times before. It didn’t seem like a process where there could be unpredictable results, where you would hear something shocking or brand new. But I like classical music. I am still attracted to it. When I began composing music using a computer and a synthesizer, I felt like they had so much power. I could create musical sequences that were completely impossible for me to perform, I could use sounds that couldn’t come from any of the instruments I had ever heard. When I discovered that there was a universe of new possibilities inside of this technology, I was very strongly attracted to that. I think if there is one thing that motivates all the work I have done, since then, it is a kind of interest in finding new ways of listening and creating and organizing sounds. Your music then is not rooted in a physical practice, because you don’t play with an instrument, necessarily. Where do the musical ideas come from then? It is also a fairly new musical culture. There is also a kind of electronic music coming from popular music. Electronic dance music was very important for me when I started. In the 1980s, my dad got ahold of some early techno records and that was the most exciting music I had heard in my life. I grew up around Boston, where we had an excellent radio station, independent record stores, and I was really fascinated by some more experimental things I was hearing that were coming from techno, hip hop, etc. Because of what? The energy? The rhythm? I grew up in a house where we were listening rock music, and my idea was to play in a rock band. I was very attracted to that energy and rhythm, but when I heard hip-hop music for the first time, it was something that had this incredibly exciting energy that was using sounds I had never heard before. Like Big Daddy Kane for example. At this time I was 12 years old, and I had a computer and a synthesizer, and I was making music that took a somewhat orchestral approach to hip-hop music. Like strong use of drums and rhythm, but then I was using much more abstract textures and strange harmonies. A lot of my early work was very much rooted in the culture of electronic dance music. Then, when I graduated from college, I got a fellowship that allowed me to go to India for six months. That was the beginning of the process of exposing myself to new musical ideas. Also in that time, I became very interested in field recording, because I was listening to all these fantastic musical sounds which were new to me, but I was also in a very different physical world. I recorded sounds of Indian cities. Street sounds, conversations, and animals that I had never heard before. And also ragas and Indian music? Yes, I was in a music school taking lessons in tabla. I was maybe a bad student, but I was deeply interested in that instrument with a lot of connections to piano. I felt that playing tabla was closer to piano than to drums. It is a melodic instrument. I think that just the physicality of it is very different. Did you learn the scale system too? Yes. A few years ago, I found my notebook from when I was taking tabla lessons. It was just hundreds of pages of progressions like, “dadadingda,” and if you didn’t know what it was, you would have opened it up and thought I was just insane. The last time I was in India, I bought an Indian drum machine. In some ways it is similar to western drum machines, where you can program patterns, but it is based on the Indian meter system, very different from the occidental one. This Indian drum sequencer is one of my favorite instruments. At some point it developed a glitch, and it just started going completely out of control. It was fascinating. I have used it in some pieces. Does the use of those instruments help new ideas to emerge? Or are they only a way to express ideas that you already have? I think that every instrument has certain ideas that are embodied in that instrument. A piano, for example—the notes will be tuned in a way that aligns with Western music. But it doesn’t align very well with traditions in Japan or Indonesia, or India, because the notes, they are quantized to the note structure. Even when you look at the keyboard, the white keys are larger than the black keys and closer to you, so the piano is telling you that the white keys are more important, and the black notes are something you have to reach for because they are smaller. They predispose us to C major and A minor. A cello also has musical ideas that are embodied in it. Yes, probably also because there are some physical movements that you cannot do because they are not technically possible. The instrument limits you. You cannot do everything you want. The composer has also to limit himself according to the instruments. Is it the same with electronic music? In the early days of electronic music, when the tradition was deeply rooted in hardware, ideas were limited. A good example of an electronic instrument that has ideas very much embodied inside of it is, for example, the drum machine. 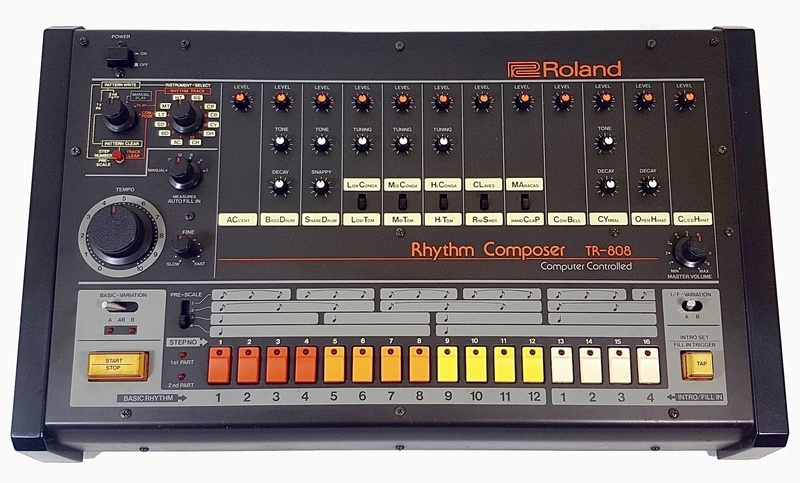 A lot of the early techno, house, and rap music, was using this drum machine from “Roland,” which was a 808 drum machine. It is a very iconic sound, still very widely used today. You would program drum patterns with a was a 16-step sequencer, and all of the notes would be quantized into the system. You could produce a range of sounds: you could change the range of the pitch of the kick drum, you could change the decay time to make it longer or shorter, but there is still a restricted pallet. Another early electronic instrument that has ideas embodied into it was another Roland instrument, the 303. It was a fairly simple synthesizer, and you could change the articulation of sound, but within a fairly small sandbox. These two machines alone gave us early house and techno music. These are the sounds that those machines want to make. Those synthesizers have a certain way of arranging rhythm, a certain way of changing the tambour of melody lines, and they are also predisposed to repetition. You would program the pattern, and it would repeat itself over and over again. It was a very hypnotic way of music making. Rather than being based on evolutions of melodies and harmony, it was based on evolutions of tambour—a more spectral music. There is also a resonance parameter. With my cello I can play a note and there is a certain duration of time it can resonate. With electronic music you can play with that, the treatment of time is completely different. Yes. When I began to work on electronic music, I was restricted by those instruments, the hardware of electronic music. I did find that I was reaching a point where I felt limited, because there was only those two instruments that I described: you can change the duration of that kick drum note, but only up to a certain maximum value. What if you would like something that was beyond what that machine was capable of? I felt that I was getting to this point where there were too many limitations to the instrument that I was working with. That was when I began to develop the practice of software programming. A big part of what I do now is I design software systems that create the sounds that are inside of my work. When you do it that way, then the limitations are gone. You can create a program that will synthetize exactly what you want, and there are no limitations created by the instrument designer. Now, you are the instrument designer. Which of course is also a big problem! How can you make work in a world where there are no limitations? Limitations are actually useful. Because if we have an instrument that can only make 88 different sounds, then we can begin composing because we know that’s the pallet. But if you have to build the instrument first, you can spend your whole life building an instrument, and you might never get to the point when you can actually compose and perform music. So the limitation is helping the creation. Yes, I think so. In fact for me, that’s the only way I can finish a work, if I have limitations. Sometimes I have to artificially create them for myself. What kind of other limitations do you have? With time you can extend it and reduce it, you can accelerate or slow it, right? Yes. In fact, a lot of musicians are playing with that. The limitations that I might create for a piece are frequently conceptual. I made a piece last year where I wanted it to respond to some physical force in the world, rather than me composing sound. I was at a Buddhist monastery in Lhasa, they had these sort of lamps where they would put candles on them, and then the heat of the candle would make this circular cone spin, and you would see a kind of animation. But it was just the heat of the candle that was causing this turbine to turn. I got this idea that maybe I could create a piece that would just create flames, but as a way of cutting evolving sound. The limitation would be that this would be controlled by fire, using candles. So, I found these pieces of electronics that basically are heat sensors. It’s the same technology that is inside a smoke detector, when the temperature goes above a certain value then the sprinklers turn on. I bought these heat sensors, then I got micro controllers, and I wrote a program that would measure the temperature of the flame. Then it would create a note, where the pitch and tambour were controlled by the temperature of the flame. I made ten of them. It was a piece of drone music. There was one, ten-voice chord that was being played, and the tambour was shifting and evolving, and the notes were bending entirely based on the flame of this candle. That was in a gallery. And of course when you work with someone else you have a dead line, and a time limitation, like it should be 4 minutes or 3 etc. Yes. And performances have to take place on a certain day. If you are lucky you will have a year. Sometimes you have two weeks. Actually I am working now on a piece with dance, and running out of time. And if you work with dancers, for example, you have to give them also some energy right? Because sometimes electronic music sounds suspended, and it would be very hard to dance on it. You mean I have to provide a narrative arch? I think I am not especially interested in that. It is a kind of classical structure, like an opera. I would say that electronic music could be composed according to this pattern. I think they commissioned more that 300 original scores by composers around the world who were doing this incredibly brave pioneering body of experimental music. And in the Cunningham tradition, the composition of music and the choreography were completely separate processes. It was forbidden that Merce Cunningham dancers should hear the music before the first time it was performed in front of an audience. The composers worked completely independently. The only thing they were told about the dance they were composing for was the rough duration. Merce Cunningham would say it will be 5 minutes long, for example. The dancers would have to improvise? No. The dancers would hardly ever be improvising. Merce Cunningham would create very, very specific compositions of movement for them. It was just that the music and the dance were never combined before the very first time it was performed. All the synchronicities between dance and music would be entirely coincidental, because the composer was not thinking about someone doing, for example, a dramatic gesture; they were working very much independently. So, that was sort of my entry into working with dancers. Through Cunningham. The way I think about it is probably more experimental because of that background. So, what was the rule for you as a composer? Complete freedom? Yes, I think so! But I think complete freedom is also a problem, because we need limitations to create work. So the work that I created with Silas (the dancer) was a system where there were a lot of limitations, because it was entirely controlled by his body. I had to create a system where the instrument was his body. And you worked also with classical instruments? Yes, when I was in India I used a lot of Indian instruments. A lot of my music now will have guitar and piano. I can play a lot of different instruments very badly. So you know how they work. And you use noise too? Yes. It is definitely interesting for me to work with sounds from the natural world, and use them to create textures. Why are they inspiring for you? I am attracted to complex sound environments, where there are complex things to listen to. The real world is an incredibly complicated sound space. So, it’s just a very rich source of complex spectral material. I also think it is a useful life practice to find beauty in the sounds of our environment. If we could find a way of listening to traffic, voices, radios, trains, cars, animals, if we could listen to them and find them engaging, life would become a lot easier for us, because we would always be surrounded by something that is deeply attractive to us. For me, it is interesting to see how so many people are isolating themselves from the world around them by listening to music. On the street, for example. It is a kind of control of the environment, a separation. Especially in cities. I am not sure if we need to listen to music outside when we are in the countryside! In the cities, where we are surrounded by other people, we need to separate ourselves from others, from the city, from the world. We can get so much by being connected to external sounds. For me, as a foreigner, it is crucial not to listen to music on the street. I need to have my ear free in order to listen to people speaking around me, to get immersed into English, and learn how to speak by imitating what I get here and there. As you said, it is a way of having control. When I put on headphones and I chose the song I want to hear, I am in control. I can choose the feeling that will be created by this piece of music. So, this is something that is important to people—to feel that they have control over their lives, control over their feelings. True. Over their feelings, too. I never thought about that. Because we don’t chose random music, we want something which will produce a certain kind of feeling. So it makes us feel less alone. True. The use of music outside is very different in France and in the US. It is very funny for me to hear people listening to music very loudly in their cars, as if they are in a club or something. In France, we have to be discrete, and people are supposed to speak quietly in public spaces, and not listen to music too loudly. Yes, it is a performance. I really love it when people transform their cars into these incredibly powerful things. A lot of people find it offensive for some reason, when people are driving in the neighborhood and they can feel the music inside their house. But this is like an incredible performance. They’ve worked so hard to create this musical system. Music is also a part of how we create our identity. So, the style of music that we associate ourselves with is a part of how we understand ourselves. It is very much a performance that people are sharing. So for you, recording sounds from the environment is useful to get an atmosphere, a specific kind of feeling? I think both. I think that sounds from our environment are interesting just in terms of music. If we try to find the melodies inside of these sounds, if we think of the different frequencies that are inside of them, it is very rich musically. But also, when we hear them, we are transported to the place where they came from. We hear the sound of a city, and we have that feeling of being surrounded by people, and surrounded by machines and architecture, and all the feelings that go with that. And when we hear the sound of the forest, we feel very differently. The sound of the ocean, all those sounds. We identify with them. It is sorting those sounds into a musical context. They are doing the work of musical sounds, but they also have a lot of different emotional characteristics, because we feel very differently about those spaces. Yes. And even if we transform them into something that is unrecognizable, somehow those feelings are still there. We can take the sounds of the ocean and dramatically transform them, but still somehow they have this emotional texture. One of my brothers composes electronic music, and he uses parts of discourses, speeches, audiobooks. It is true that with the sounds come the culture, and then some particular atmosphere. Do you use texts too? I have done some work where I was collaborating with writers. Like Jesse Ball, a novelist and a poet. In this case you are given a context, a meaning. That’s not the case when there is only music. Yes. When I was beginning to work very seriously in electronic music, it was one of the great powers of this art form that there were no words. No specific ideas. Which makes it very powerful, because then the listeners can interpret for themselves the meaning. But if you have a piece where there are very clear words, then you are beginning to dictate the meaning of the music. To me that felt very constraining and overly specific. Those are very important things that people should be thinking about. That’s a wonderful use of imposing specific meaning on your work. Part of the reason I am attracted by collaborating with writers was because they are people whom this is their craft. Yes. An idea which was alien to me. Do you use samples too? From classical music, pop, jazz etc. Yeah. A little bit. Very little of my work has recognizable samples. If I do use a piece of preexisting music, I am usually attracted to transforming it into something very different. I can think about a piece I worked on with Silas. I went to a shop in NYC, a junk shop, a thrift store where you have very inexpensive used things, and usually the quality is very bad. I went to the worst junk shop that I could find, and there were a lot of old records that were in terrible condition. They weren’t stored in sleeves. I bought a stack of old records. I just looked at them visually, the titles, etc. Their very, very bad condition attracted me. In the first half, 20 minutes, of that dance piece, Silas takes a record player and puts it on the dancefloor, and when he lands on the floor the record just skips. He wrote this whole section of choreography so that he is intentionally making these records jump. Then I also modified the record player: I tied it with a piece of string so that when it had moved halfway inward, it would get stuck and start looping. I was intentionally buying 78 RPM records so that, when it was skipping, it stopped at a very specific tempo. So that’s an example of using existing, created music, and transforming it into something different. So there is a specific material and you can then transform it to make something different. The transformation is the base. Yes. I still think of that as my composition for Silas. I created the system that transformed the sound, and the system has an input, in this case records. And then when you decide to keep one sound rather than another to create a piece, what is the criterion? A classical musician should respect the rules of harmony. But you? Even without the rules of harmony you have to balance the power of instruments! The taste is not enough! I would say that it just has to be an intuitive way of responding. I think the longer I have been working on it, the less interested I am in my own decision that way. So, I don’t think there is something inherently special about my ideas, or my opinions about sounds, or about music. I don’t think it is important to people to become deeply familiar with my ideas, my music. I don’t think I deserve some kind of priority over anybody else. Nonetheless, I want to make music. I am deeply attracted to this idea of creating artwork with sound. Increasingly when it comes to the decision making part, I will just outsource it. For example, the piece I made where the sounds are created by candles, I create the system. It is still the expression of my ideas, but it is also a system where I surrender the control to something else. In that case, the control is fire. Or the music I have done with Silas, ultimately what we hear would be articulated by his body. Yes. It is his action. He literally creates the sound. There is not aesthetic parameter. Yes and no. I am still creating the instrument that will be used to create the sound. I still have my musical ideas, the instruments, certain kinds of sounds I prioritize. It is a balance of a way of getting to use the sounds that I find interesting, the sounds that reflect my life, which is a life in electronic music and synthesizers and drum machines, and also surrendering some control and saying, “It will not be me who’s making the decisions, it will be something else in the world.” I guess, whether I like it or not, I am still in there. I am still attracted to this idea that the decision-making can be shared by something outside of yourself. Maybe it is the same with classical and jazz music to a certain extent. Yes, also a participation of the community in the decision making. That’s nice, that’s another way of surrendering control outside of yourself. Making music is a kind of collaborating community action. Well, thank you very much for this very lively discussion, and I hope to have the opportunity to listen to your next creation here in Pittsburgh!